Created for the finest restaurants, this welcoming, medium-dark roasted coffee has full-bodied flavor with a smooth and balanced finish. Made from only 100% select Arabica coffee beans. Enjoy 64 ounces (approx 230 six-ounce cups of coffee.) Enjoy the taste of our Cafe Special Blend medium dark roast (full body, low-medium brightness, smooth and full-flavored taste.) Perfect coffe and dessert pairings: enjoy Cafe Special Blend with your creamy and tart desserts as well as complex multi-flavored desserts. 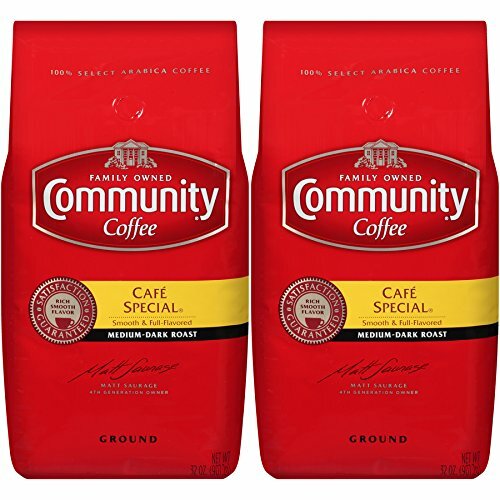 Cafe Special Blend, ground medium dark roast coffee, also available in ground 12 ounce bag, 16 ounce (1 pound) bag and 23 ounce bag as Between Roast, 36 count and 72 count box single serve coffee pods (compatible with Keurig KCup brewers). You may also enjoy medium dark roast Coffee and Chicory, House Blend, and other medium dark roasts from our gourmet coffee line: Private Reserve Founders Blend, and Private Reserve Evangeline Blend. The roast refers to the temperature which the coffee bean was roasted. The roast determines the flavor of the coffee. Light roasts are described as 'sweet' or 'well-balanced', while dark roasts are intense and lively. The body is the weight of the cofee on the tongue. It’s described as 'syrupy', 'heavy' or 'buttery'. The brightness (acidity) refers to the tangy quality, liveliness or bright note that highlights the flavor of the coffee. Acidity is felt on the sides and back of the tongue. High acidity is described as 'winey', 'bright', 'lively', 'sharp', or 'tangy'. If you have any questions about this product by Community Coffee, contact us by completing and submitting the form below. If you are looking for a specif part number, please include it with your message.